Major and trace elements, minerals and grain-size were analysed from a sediment core covering the last 4,000 years of an Austrian Alpine lake (Oberer Landschitzsee, ObLAN, 2,076 m a.s.l.). These analyses were combined with autumn and spring temperature anomalies and ice-cover estimated from a diatom and chrysophyte cyst, thermistor-based regional calibration dataset and selected pollen markers published previously. 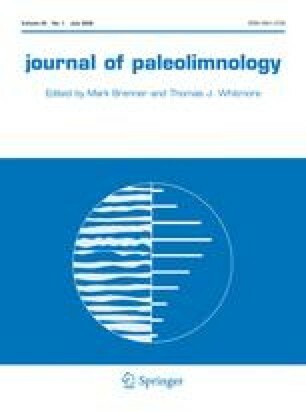 Diatom-inferred pH (Di-pH) and DOC (Di-DOC) completed the multi-proxy approach, which, together with ordination techniques (PCA and RDA), helped (1) to confirm proposed climatic patterns and hypotheses, and (2) to disentangle the complex interactions between climatic and anthropogenic impacts. Shifts in chemical and physical weathering, erosion, production, lake stratification, redox potentials and air pollution were the major processes that have affected Oberer Landschitzsee in relation to climate, lake/catchment interactions, and human impact. Geochemistry supported the finding that the four waves of high-altitude land use (Early to Middle Bronze, ca. 1,800–1,300 B.C. ; Late Bronze to Hallstatt, ca. 1,000–500 B.C. ; Celtic to Roman, ca. 300 B.C.–400 A.D.; and Medieval, ca. 1,000–1,600 A.D.) were coupled mainly with warm periods. Increased production, onset of lake stratification, and the deterioration of hypolimnetic oxygen conditions were the major changes governing in-lake processes during climate warming. They resulted in specific element assemblages associated with organic matter accumulation (Br), oxygen depletion (As, Ga, Cu, S), and changes in redox (Fe/Mn). The Se/Di-DOC ratio was introduced to track shifts between in-lake production and allochthonous sources. Nutrient loading from pastures, coupled with climate warming, could explain that in-lake production was highest during Roman and Medieval land use. Lithogenic elements mainly originated from chemical weathering of silicate bedrock and they increased when intense land-use was coupled with climate deterioration and/or increased humidity. These perturbations were highest during a High Medieval climate fluctuation around 1,000 A.D. The association of sand with LOI and C/N and the decoupling of sand from quartz and feldspar separates erosion from physical weathering. Di-DOC, S, and C/N showed hybrid characters in relation to climate and human impact. The mineral proportions indicated gradients in relation to weathering, snow-cover and running waters, as well as vegetation. Air pollution by metallurgic industries, starting during the High Medieval and culminating during the Late Medieval, caused lead accumulation and could have contributed to As and S enrichment. Corresponding features in the distribution of selected elements and pollen tracers, as well as changes in mineral proportions, supported the hypotheses of shifts in seasonal climate and an overall trend towards more continental climate conditions since Medieval times. The investigations were funded by the Austrian Science Fund (FWF project No. P14912-B06) and by the Austrian Academy of Sciences research program “Alpenforschung” (project CLIM-LAND). We would like to thank A. Cheburkin and B. Shotyk (Univ. Heidelberg) for geochemical analysis, J. Knoll for technical assistance, R. Psenner (Univ. Innsbruck) and anonymous reviewers for critical comments.